In the May/June 2012 Alberta Doctors’ Digest, I encouraged all readers and Alberta Medical Association (AMA) members to give serious thought to writing a memoir about the significant personal or medical events in their lives. I hope this idea has been given some consideration, particularly by members with the perspective of a lifetime. In researching Alberta’s medical history over the years, I occasionally stumbled on a document or autobiographical essay squirreled away in a file or archive. Usually it was in the first person. These were always exciting finds, giving first-hand reflections on life events that were important to the authors. They were treasures to say the least. I am grateful that the AMA has offered to print a series of condensations of them, which I will narrow to medical topics and issues at the time. They will highlight the influence and impact physicians have had on medicine in Alberta and Canada. These physicians went well beyond pioneering and providing care under limited and challenging circumstances. The first essay focuses on Dr. George A. Kennedy and the origins of the AMA. Visitors to the AMA office in Edmonton may have seen a photo of him outside the boardroom, leading the long line of AMA presidential photographs. 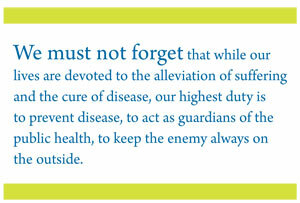 Dr. Kennedy greeted the first group of organized physicians in Western Canada, in 1890, and read them his charge. In his short life of 55 years (1858-1913), he accomplished much and left even more for future generations. Born in Sir William Osler’s home of Dundas, Ontario, and nine years younger than Dr. Osler, he graduated from the University of Toronto in 1878 – too young to legally write a prescription. So he signed a four-year contract as the fourth North West Mounted Police surgeon and headed up the Missouri that fall like Mark Twain, the year after Sitting Bull and 2,900 Sioux had crossed into Canada, and one year before the buffalo disappeared. He provided care to the Lethbridge miners until Dr. Frank H. Mewburn arrived in 1886, the same year Dr. Osler toured southern Alberta. They talked about tuberculosis (TB). At the first Canadian Medical Association meeting west of Toronto (Banff in 1889), he presented the only paper at the meeting by a prairie physician, on “A Climate of Southern Alberta,” and its relation to disease. Immediately after the meeting he was elected president of the Northwest Territories Medical Association (NWTMA) for 1889-90. He continued on the Northwest Territories (NWT) Medical Council established by the 1888 Ordinance, becoming the president from 1901-06. It was superseded by the Alberta and Saskatchewan medical associations and colleges. He would become the second president of the College of Physicians & Surgeons of Alberta. At the second meeting of the NWTMA in Medicine Hat in September 1890, Dr. Kennedy charged the assembled members, and all future ones, with a set of expectations and predictions that are worth repeating. Although 123 years have passed, his foresight and insight into the life of the AMA and its members is worth recalling for the inspiration it provides. “It is almost impossible to overestimate the importance of what we have before us. From smallest acorns, giant oaks do grow. 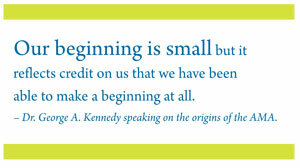 Our beginning is small but it reflects credit on us that we have been able to make a beginning at all. When we reflect that Manitoba, with its metropolitan city, its medical college, its population, dense as compared to ours, and its easy means of communication between all parts of a province infinitely smaller than our territory, was able, only this last spring, to form an association, we have, I say, every reason for self-glorification in having justly earned the title of the premier medical association of Western Canada. “Our beginning is small, I repeat, but who will say that we cannot look forward with confidence to the time when the NWTMA will be the parent organization of numerous city, country, and provincial associations, all formed and carried on for the same purpose – the intercommunication of ideas, the scientific discussion of medical and surgical subjects, and the elevation generally, of our noble profession. The association has a long, useful and honorable career before it. Difficulties there may be, but difficulties were made to be overcome. Disappointments will crop up, and there will doubtless be times of trial, times when things look gloomy, when the spirit will be weary, and we may be inclined to say, Cui Bono, and throw up the sponge. These times come in the lives of associations, as they do in the lives of individuals. But we are most of us young, and I have an idea that we are not formed of the stuff of which failures are made. A little sustained enthusiasm, a little self sacrifice at times, a little of a feeling towards the Association, kindred to that which we cherish towards our alma mater, and the future can bring us nothing that we need fear. “To that end, and looking towards the future, I trust that the constitution of the association which it will be your duty to approve has been framed in the broadest and most liberal spirit. To rear a superstructure, both solid and enduring, the foundation must be both broad and deep. There must be no room for dissensions, for future envy or sectional jealousy. Nothing is more blighting in its effects, nothing is more dangerous than internal dissensions, and nothing is more productive of them than a badly framed constitution. The democratic principle can hardly be carried too far. Let the work be thoroughly done. “A matter ultimately connected with this and naturally following it is the adoption of a tariff of fees, which, having received the sanction of the association, will serve as a guide to each one of us and be recognized by the courts. I think I may leave this to you in the full confidence that the duty will be efficiently performed. “There is a subject to which I hope to refer during our proceedings, which requires, not so much discussion, as action, at our hands. It is the care of the insane in the NWT. As the law at present stands, lunatics may be kept confined in the common jails, or more frequently in the mounted police guardrooms, for periods varying from a week to two or three months, while evidence is being taken, and the Lieutenant Governor deciding as to what course he shall take. If the evidence appears to him to warrant such action he directs the lunatic to be forwarded to Manitoba. He or she, as the case may be, is then taken not to an asylum, but to the penitentiary at Stoney Mountain, where some 70 from the territories are now confined, in a wing, which is given up entirely to them. Although confined in a penitentiary they are as well treated as possible, under the circumstance, still, it is not right that such a state of affairs should be allowed to continue. They cannot of necessity have that care and attention and those surroundings, which gives them the best chance of recovery, if curable, or lighten their dark lot, if reason is gone forever. I am personally averse to making many representations to government, entailing the expenditure of public monies, but I certainly think we should be recreant to our trust, if we did not direct attention to the existing state of affairs, and urge upon the government our conviction that an asylum for the territories is a great and pressing public necessity. Dr. Kennedy’s eloquence and attention were not limited to these concerns. He would advocate to secure physician coverage for the Blood Indians wherever it was absent. He researched and wrote of the last great Indian battle under the Lethbridge Bridge between the Crees and Blackfoot in 1870. He sent a team to the Frank Slide in 1903, and vigorously pursued the establishment of a Dominion Medical Council and a national portable examination. Dr. George E. Learmonth described Dr. Kennedy as “of medium height, of handsome features and of military bearing.” He was much attracted “by his genial personality and keen intelligence.” His competence extended to polo, hunting and golfing. He helped establish the only golf course between Winnipeg and Vancouver. In his memory, the Kennedy trophy was presented for medal play at the 1937 Alberta medical golf tournament. Sadly, Dr. Kennedy developed an ulcer on his tongue which was cancerous. Visits to Calgary, Edmonton and Winnipeg followed. He died after surgery in Winnipeg, ending his plans to visit medical centers in England to study TB, once his son Alan had joined him in practice. Fort Macleod lost its most notable pioneer and one of the finest physicians medicine could provide.